1. When does the audit process begin? The audit process commences with the issuance of a Letter of Authority to a taxpayer who has been selected for audit. 2. What is a Letter of Authority? The Letter of Authority is an official document that empowers a Revenue Officer to examine and scrutinize a Taxpayer’s books of accounts and other accounting records, in order to determine the Taxpayer’s correct internal revenue tax liabilities. 3. Who issues the Letter of Authority? Letter of Authority, for audit/investigation of taxpayers under the jurisdiction of National Office, shall be issued and approved by the Commissioner of Internal Revenue, while, for taxpayers under the jurisdiction of Regional Offices, it shall be issued by the Regional Director. 4. When must a Letter of Authority be served? A Letter of Authority must be served to the concerned Taxpayer within thirty (30) days from its date of issuance, otherwise, it shall become null and void. The Taxpayer shall then have the right to refuse the service of this LA, unless the LA is revalidated. Twice, in the case of LAs issued by the National Office. Any suspended LA(s) must be attached to the new LA issued (RMO 38-88). 6. How much time does a Revenue Officer have to conduct an audit? A Revenue Officer is allowed only one hundred twenty (120) days from the date of receipt of a Letter of Authority by the Taxpayer to conduct the audit and submit the required report of investigation. If the Revenue Officer is unable to submit his final report of investigation within the 120-day period, he must then submit a Progress Report to his Head of Office, and surrender the Letter of Authority for revalidation. 7. How is a particular taxpayer selected for audit? Officers of the Bureau (Revenue District Officers, Chief, Large Taxpayer Assessment Division, Chief, Excise Taxpayer Operations Division, Chief, Policy Cases and Tax Fraud Division) responsible for the conduct of audit/investigation shall prepare a list of all taxpayer who fall within the selection criteria prescribed in a Revenue Memorandum Order issued by the CIR to establish guidelines for the audit program of a particular year. The list of taxpayers shall then be submitted to their respective Assistant Commissioner for pre-approval and to the Commissioner of Internal Revenue for final approval. The list submitted by RDO shall be pre-approved by the Regional Director and finally approved by Assistant Commissioner, Assessment Service (RMOs 64-99, 67-99, 18-2000 and 19-2000). When there is a need to verify the Taxpayer’s compliance with withholding and other internal revenue taxes as prescribed in a Revenue Memorandum Order issued by the Commissioner of Internal Revenue. When the Commissioner chooses to exercise his power to obtain information relative to the examination of other Taxpayers (Secs. 5 and 235, NIRC). Conduct inventory and surveillance, and prescribe presumptive gross sales and receipts (Sec. 6, NIRC). 10. Within what time period must an assessment be made? An assessment must be made within three (3) years from the last day prescribed by law for the filing of the tax return for the tax that is being subjected to assessment or from the day the return was filed if filed late. However, in cases involving tax fraud, the Bureau has ten (10) years from the date of discovery of such fraud within which to make the assessment. Any assessments issued after the applicable period are deemed to have prescribed, and can no longer be collected from the Taxpayer, unless the Taxpayer has previously executed a Waiver of Statute of Limitations. Substantiate all or any of the deductions, exemptions or credits claimed in his return. A jeopardy assessment is illegal. 12. What is a Pre-Assessment Notice (PAN)? The Pre-Assessment Notice is a communication issued by the Regional Assessment Division, or any other concerned BIR Office, informing a Taxpayer who has been audited of the findings of the Revenue Officer, following the review of these findings. If the Taxpayer disagrees with the findings stated in the PAN, he shall then have fifteen (15) days from his receipt of the PAN to file a written reply contesting the proposed assessment. When an article locally purchased or imported by an exempt person, such as, but not limited to, vehicles, capital equipment, machineries and spare parts, has been sold, traded or transferred to non-exempt persons. 14. What is a Notice of Assessment/Formal Letter of Demand? A Notice of Assessment is a declaration of deficiency taxes issued to a Taxpayer who fails to respond to a Pre-Assessment Notice within the prescribed period of time, or whose reply to the PAN was found to be without merit. The Notice of Assessment shall inform the Taxpayer of this fact, and that the report of investigation submitted by the Revenue Officer conducting the audit shall be given due course. The formal letter of demand calling for payment of the taxpayer’s deficiency tax or taxes shall state the facts, the law, rules and regulations, or jurisprudence on which the assessment is based, otherwise, the formal letter of demand and the notice of assessment shall be void. Duly acknowledge his receipt of the appropriate Letter of Authority upon its presentation by the Revenue Officer authorized to conduct the audit by affixing in the Letter of Authority the name of the recipient and the date of receipt. Submit the necessary schedules as may be requested by the Revenue Officer within a reasonable amount of time from his (Taxpayer’s) receipt of the Letter of Authority. 16. What is the recourse of a Taxpayer who cannot submit the documents being required of him within the prescribed period of time? If a Taxpayer, believing that he cannot present his books of accounts and/or other accounting records, intends to request for more time to present these documents in order to avoid the issuance of a Jeopardy Assessment, the Taxpayer may execute what is referred to as a Waiver of the Statute of Limitations. 17. What is a Waiver of the Statute of Limitations? The Waiver of the Statute of Limitations is a signed statement whereby the Taxpayer conveys his agreement to extend the period within which the Bureau may validly issue an assessment for deficiency taxes. If a Taxpayer opts to execute a Waiver of the Statute of Limitations, he shall likewise be, in effect, waiving his right to invoke the defense of prescription for assessments issued after the reglementary period. No Waiver of the Statute of Limitations shall be considered valid unless it is accepted by a duly authorized Bureau official. 18. If a Taxpayer does not agree with the assessment made following an audit, can he protest this Assessment?Yes, he can. A Taxpayer has the right to contest an assessment, and may do so by filing a letter of protest stating in detail his reasons for contesting the assessment. a.) Name of the taxpayer and address for the immediate past three (3) taxable year. b.) Nature of request whether reinvestigation or reconsideration specifying newly discovered evidence he intends to present if it is a request for investigation. c.) The taxable periods covered. e.) Date of receipt of assessment notice or letter of demand. f.) Itemized statement of the findings to which the taxpayer agrees as a basis for computing the tax due, which amount should be paid immediately upon the filing of the protest. For this purpose, the protest shall not be deemed validly filed unless payment of the agreed portion of the tax is paid first. g.) The itemized schedule of the adjustments with which the taxpayer does not agree. h.) A statement of facts and/or law in support of the protest. The taxpayer shall state the facts, applicable law, rules and regulations or jurisprudence on which his protest is based, otherwise, his protest shall be considered void and without force and effect on the event the letter of protest submitted by the taxpayer is accepted, the taxpayer shall submit the required documents in support of his protest within sixty (60) days from date of filing of his letter of protest, otherwise, the assessment shall become final, executory and demandable. It is filed within thirty (30) days from the Taxpayer’s receipt of the Notice of Assessment and formal Letter of Demand. 20. In the event the Commissioner’s duly authorized representative denies a Taxpayer’s protest, what alternative course of action is open to the Taxpayer? If a protest filed by a Taxpayer be denied by the Commissioner’s duly authorized representative, the Taxpayer may request the Commissioner for a reconsideration of such denial and that his tax case be referred to the Bureau’s Appellate Division. The Appellate Division serves as a “Court”, where both parties, i.e. the Revenue Officer on one hand, and the Taxpayer on the other, can present testimony and evidence before a Hearing Officer, to support their respective claims. 21. What recourse is open to a Taxpayer if his request for reconsideration is denied or his protest is not acted? Should the Taxpayer’s request for reconsideration be denied or his protest is not acted upon within 180 days from submission of documents by the Commissioner, the Taxpayer has the right to appeal with the Court of Tax Appeals (CTA). Any appeal must be done within thirty (30) days from the date of the Taxpayer’s receipt of the Commissioner’s decision denying the request for reconsideration or from the lapse of the 180 day period counted from the submission of the documents. (Sec. 228 of the Tax Code, as amended). 22. If the Taxpayer is not satisfied with the CTA’s decision, can he appeal the decision to a higher Court? Yes, he can. Decisions of the Court of Tax Appeals may be appealed with the Court of Appeals within fifteen (15) days from the Taxpayer’s receipt of the CTA’s decision. In the event that the Taxpayer is likewise unsatisfied with the decision of the Court of Appeals, he may appeal this decision with the Supreme Court. 23. Can a Taxpayer claim a refund or tax credit for erroneously or illegally collected taxes? Yes, he can. The Taxpayer may file such a claim with the Commissioner of Internal Revenue (Sec.229, NIRC), within two (2) years from the payment of the tax or penalty sought to be refunded. Failure of the Taxpayer to file such a claim within this prescribed period shall result in the forfeiture of his right to the refund or tax credit. 24. If a Taxpayer has filed a claim for refund and the Bureau has yet to render a decision on this claim, can the Taxpayer elevate his claim to the CTA? 25. What means are available to the Bureau to compel a Taxpayer to produce his books of accounts and other records? A Taxpayer shall be requested, in writing, not more than two (2) times, to produce his books of accounts and other pertinent accounting records, for inspection. 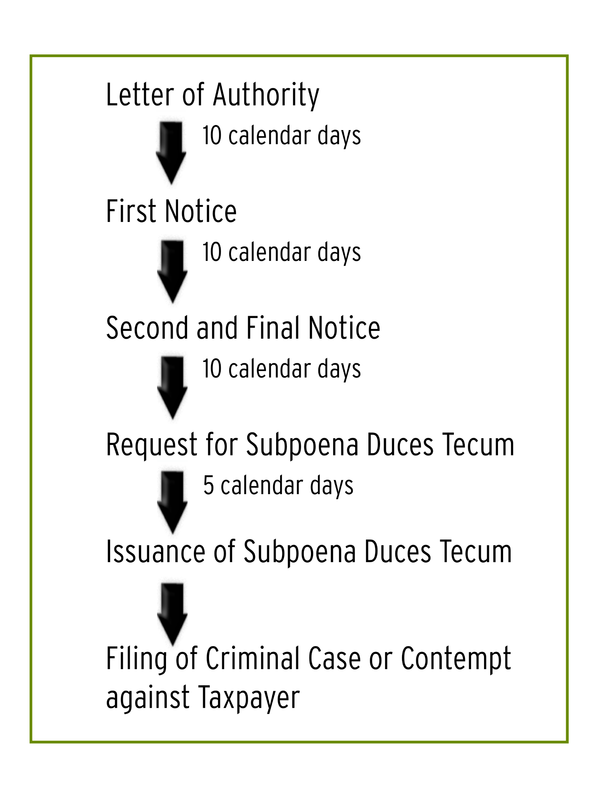 If, after the Taxpayer’s receipt of the second written request, he still fails to comply with the requirements of the notice, the Bureau shall then issue him a Subpoena Duces Tecum. 26. What course of action shall the Bureau take if the Taxpayer fails to comply with the Subpoena Duces Tecum? Initiate proceedings to cite the Taxpayer for contempt, under Section 3(f), Rule 71 of the Revised Rules of Court. 27. What alternatives are open to Government for the collection of delinquent accounts? 28. What is “Distraint of Personal Property”? Distraint of personal property involves the seizure by the Government of personal property – tangible or intangible – to enforce the payment of taxes, followed by the public sale of such property, if the Taxpayer fails to pay the taxes voluntarily. 29. What is “Levy of Real Property”? Levy of real property refers to the same act of seizure, but in this case of real property, and interest in or rights to such property in order to enforce the payment of taxes. As in the distraint of personal property, the real property under levy shall be sold in a public sale, if the taxes involved are not voluntarily paid following such levy. 30. In what time period must collection be made? Any internal revenue tax, which has been assessed within the period prescribed shall be collected within three (3) years from date of assessment. However, tax fraud cases may be collected by distraint or levy or by a court proceeding within five (5) years from assessment of the tax or from the last waiver. Robert Kiyosaki: From Rich Dad to Bankrupt Dad? I first heard about Robert Kiyosaki was when I was in high school. My older brother was raving about it during one of our Sunday family gatherings. He was so amazed with the unorthodox ideas that Mr. Kiyosaki shared in his first book, Rich Dad, Poor Dad. However, being young and carefree back then, it wasn’t until after several years when I was already in law school that I began reading his books. Indeed, in communicating his point of view on why ‘old’ advice – get a job, save money, get out of debt, invest for the long term, and diversify – is ‘bad’ (both obsolete and flawed) advice, Robert has earned a reputation for straight talk, irreverence and courage. So revolutionary were his teachings that when I shared them with my dad, he simply shot them down for being a bunch of nonsense. Of course, now that I am a licensed attorney and financial planner, I realized that Mr. Kiyosaki’s teachings actually made a lot of sense. Nevertheless, in late A.D. 2012, news began to spread all over social media that Rich Dad® Robert Kiyosaki is now a bankrupt dad because in August of that year, his company, Rich Global LLC, just filed for bankruptcy. So does this really mean that one of the world’s most famous, if not the most famous, personal finance gurus, the one who was allegedly mentored by his best friend’s rich dad several decades ago as a child, failed and became poor all of a sudden? Before we get to that, let me first give you an idea on what filing for corporate bankruptcy really means. Title 11, of the United States Code, a.k.a. the United States Bankruptcy Code, is the main source of bankruptcy law in the United States. Chapter 7 thereof governs the process of liquidation and is the most popular and common form of bankruptcy. When a troubled business is badly in debt and unable to service that debt or pay its creditors, it may file for bankruptcy in a federal court under Chapter 7. A Chapter 7 filing means that the business ceases operations unless continued by the Chapter 7 trustee. A trustee is appointed almost immediately, with broad powers to examine the business’s financial affairs. The trustee generally liquidates all the assets and distributes the proceeds to the creditors. In a Chapter 7 case, a corporation or partnership does not receive a bankruptcy discharge—instead, the entity is dissolved. Only an individual can receive a discharge. Once all assets of the corporate or partnership debtor have been fully administered, the case is closed. Here in the Philippines, our laws refer to bankruptcy proceedings as ‘insolvency’ proceedings. In fact, just five years ago, the Financial Rehabilitation and Insolvency Act of 2010 or FRIA was passed. The new law provides for the substantive and procedural requirements for the rehabilitation or liquidation of financially distressed enterprises and individuals. The FRIA defines “insolvent” as the “financial condition of a debtor that is generally unable to pay its or its liabilities as they fall due in the ordinary course of business or has liabilities that are greater than its or his assets.” Now you may ask, why would a very rich man like Robert Kiyosaki allow the company he built to go bankrupt or insolvent? It was reported that the founder of Learning Annex, Bill Zanker, sued Rich Global for $24 million. Learning Annex was one of his supporters when he was still starting as a businessman. Actually, Robert Kiyosaki owns many businesses and Rich Global LLC is just one of those corporations. Robert now runs most of his businesses under his other company, Rich Dad Co. In fact, Rich Dad Co. CEO Mike Sullivan informed the New York Post in an interview that Robert Kiyosaki would not be putting any of his personal fortune toward the settlement. Now, that is the beauty of using a corporate entity as a vehicle for one’s business. It provides a layer of protection against asset raiders such as legal plaintiffs. You see, when a company files for bankruptcy or insolvency, its creditors, including its judgment creditors, cannot just simply collect from the company nor seize it assets legally without first complying with the requirements of the law. That is why Robert Kiyosaki is still quite rich even after filing for bankruptcy with an estimated net worth of $80 million. Having his company Rich Global LLC file for bankruptcy was merely a legal strategy in order to protect his personal assets. Instead of losing his credibility as a personal finance coach and wealth advisor, such a bold move by Robert Kiyosaki just proves that he is indeed financially intelligent. So much so that he is certainly more financially intelligent than most people, especially those who immediately jumped the gun in judgment against him upon reading the news headlines about his company filing for bankruptcy. Although I have my differences with some of his theories, I along with my colleagues in the financial services industry consider his books as indispensable reading in personal finance and entrepreneurship. It is truly undeniable that all of us, in one way or another, were illuminated and inspired by his teachings. 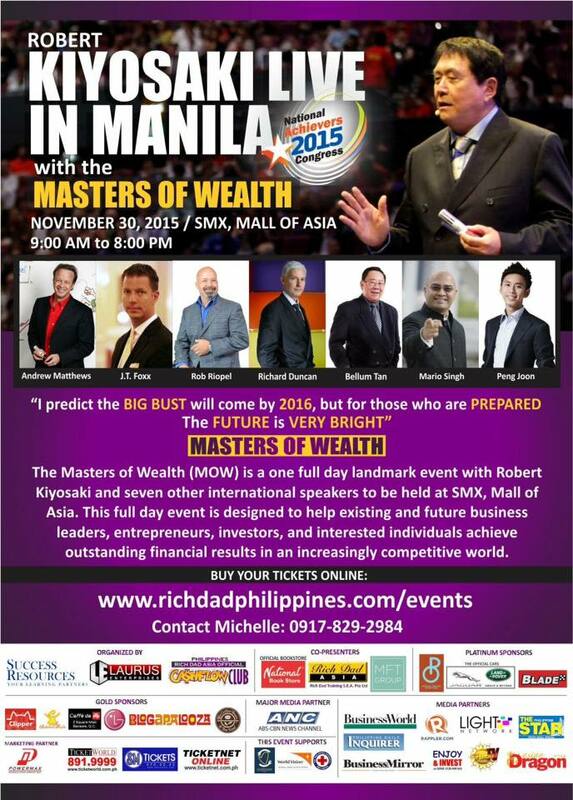 I am so excited about his upcoming event, Robert Kiyosaki Live in Manila: Masters of Wealth, which will be held on November 30, 2015 at the SMX, Mall of Asia. It’s a once in a lifetime opportunity to learn not only from the master himself but also from other world class wealth coaches, economists, businessmen and educators. I believe that to be financially successful, the first asset that we should invest in is ourselves.